My children are very picky eaters. As far as I remember even my breast milk had to be spiced up with either Indian or Thai food for my children to enjoy their meal time, jk! They like spices, they like trying different cuisines. But I crave simplicity sometimes. I just want to throw things on their plates and call it a day! 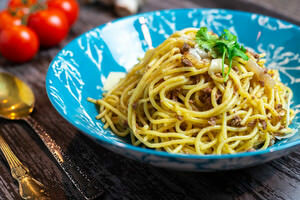 This ground beef spaghetti is one of those dishes. Throw it together, add some spices and you are done. What’s not to love about it. It is not as rich in spices like Indian food would, but it definitely hits the empty spot in your stomach. As for the recipe itself, it is not an Italian recipe. This is an old Russian recipe for a Navy-style Macaroni (Макароны по-флотски). It became quite popular by the end of second Wolrd War and there are many references in old war books for this recipe being made on board of Warships. It is also a very dear childhood comfort food for me. Probably one of the first ones I learned to cook, too. 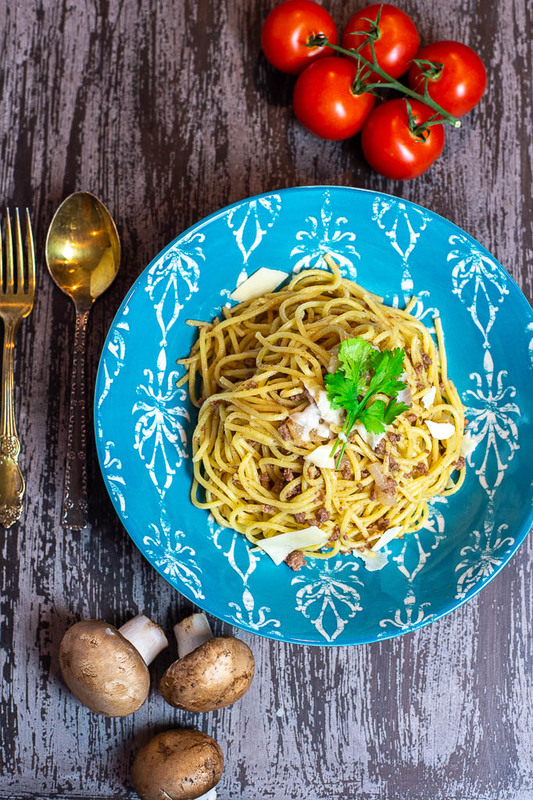 You can use any type of pasta for this recipe. Whatever you have handy will work. Spaghetti is just easier to eat with ground beef. This is also a good time to boil 2 liters of water in a pot to cook the spaghetti. (Sorry, no photos here! There was a slight mishap in my kitchen today) Once the water is boiling, add 1/2 TBSP salt and drop the spaghetti into the boiling water. Turn the heat down a notch so that the water doesn’t boil over and cook the spaghetti until slightly undercooked. We will cook them through or make them al dente a little later into the recipe. While the spaghetti is getting cooked, we will deal with the meat gravy. Grab a large skillet, with a deeper bottom. Turn the heat on medium-high, melt the butter or the clarified butter. Place onions on top of the melted butter and slightly cook it down, for about a minute. 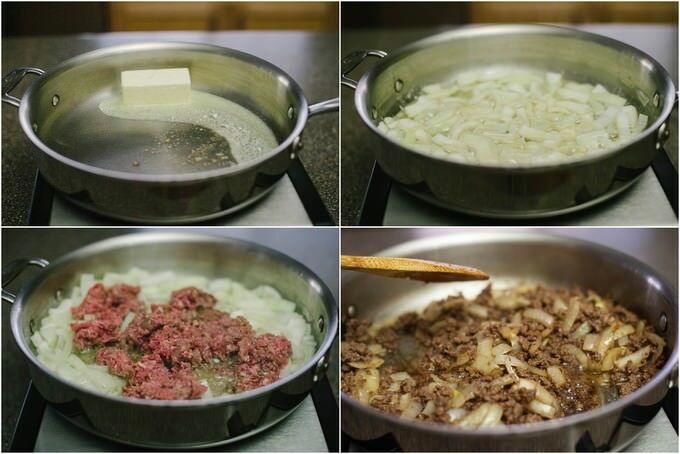 Add the ground beef and break it down with a spatula. Mix in the chopped garlic, add 1 tsp of salt, 1/2 tsp black pepper and 1 tsp of cumin. Mix everything well and let the mixture cook while stirring occasionally. If you feel like you need to turn the heat down a bit, do so. Once the onions start caramelizing and the beef is browning, add 1/2 cup of water into the skillet, cover the skillet, turn the heat down to low and simmer the mixture for 5 minutes. The timing of spaghetti cooking and gravy frying should coincide. Turn the heat off from under the spaghetti and bring the pot next to the meat mixture. Using a pair of tongues fish out the slightly undercooked spaghetti and place it in the skillet with meat. 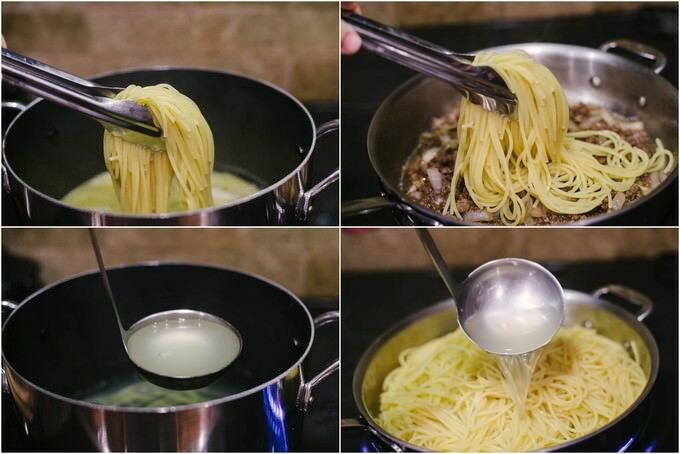 Grab a ladle and pour 2 cups of water from under the spaghetti on to the meat mixture. Mix everything very well. Coat the spaghetti in the buttery goodness. Cover the lid of the skillet, turn the heat down to medium-low and let the spaghetti rest for 4-5 minutes. If you need more water in there, feel free to add a little more. That’s the best kind of water to cook everything in. Before you serve the spaghetti make sure the spices are all in order and that it does not need any more salt. You can serve it with some shredded cheese or a little bit of marinara sauce. But that becomes a totally different dish, right? :P That’s it! It should take you no more than 20 minutes to put it all together and voila, you have one delicious dinner ready! 4 oz clarified butter or just butter butter makes everything taste better. I swear! Mix everything very well. Cover the lid of the skillet, turn the heat down to medium-low and let the spaghetti rest for 4-5 minutes. If you need more water in there, feel free to add a little more. That’s the best kind of water to cook everything in.